Apologies for the terrible picture - by the time I realized how good this was going to come out, it was gone ! One of the things I love about Italians is that not only do they love food, they waste nothing. A loaf of stale bread isn't something to be thrown out, to an Italian - it's a springboard, a gateway drug to all sorts of culinary delights. Not that the Italians have dibs on delicious things to do with stale bread, of course...this very blog is loaded with recipes for bread puddings, both savory and sweet; there are also references to French toast, croutons etc....but we're sticking with an Italian theme here. The only trick to this soup is to use a bread with some heft - something nice and dense that isn't going to dissolve in your soup. (Most French breads, although wonderfully useful when stale, would probably be a bit too airy for this - though use 'em if you got 'em, I say.). For this batch, I used a loaf of Italian Pugliese; sourdough, a dense ciabatta, or any peasant-type bread would work. Leftover rolls would be perfect - lots of nice crust to go around. If you want to make this and don't have stale bread on hand, just find the "day-old" rack in your supermarket and select a worthy candidate. Even a flavored bread would work, as this is one of those happy soups that take to all sorts of variation. Any kind of bean would probably be at home here, as would any sort of leftover vegetable. Spinach or Swiss chard could very easily stand in for the kale, if you're adverse to kale (though you should try it in this - it's wonderful). The recipe can easily be made kosher (yet still delicious) by omitting the pancetta and using vegetable stock or could even become vegan via the use of a vegan cheese alternative. Go forth and experiment...there's no wrong here ! Heat the oil in a large, heavy pot over medium heat. Add the onion and pancetta and cook for 5-10 minutes, or until the onions become translucent. Stir in the tomato paste, and add the carrots, celery, garlic, and salt and pepper to taste and cook for another 10 minutes or so, or until the vegetables just start getting tender (add a ladle or so of stock if it seems to be getting too dry.). 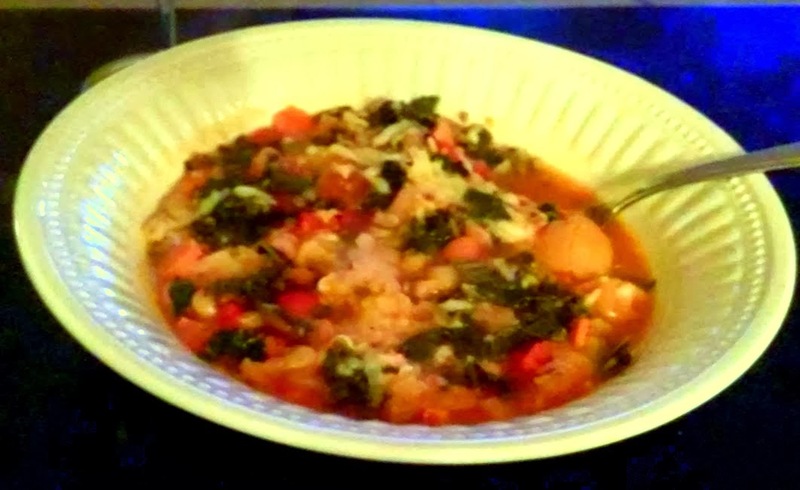 Add the tomatoes, kale, beans, basil, bay leaf, and Parmesan rind if using along with the 6 cups of stock and simmer over low heat for 20 minutes. Add the bread cubes, along with some additional stock if the soup seems too thick (though you do want it thick) and simmer for 10 more minutes. *I buy tomato paste in tubes that resemble toothpaste tubes; these are awesome when you just need to add a little bit to something as you can store the rest in the fridge. If you only have cans, I suggest freezing the rest in tablespoon-sized scoops; stick them on a paper plate until frozen, then store them in a baggie once frozen. Way useful ! 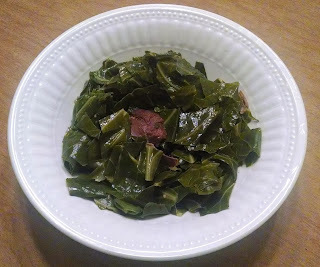 The BEST Collard Greens EVER ! I promise, they are the BEST ! 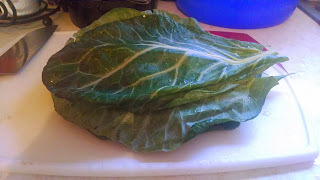 Honestly, I'm getting to the ribollita soon...but first, I have to talk about collard greens. Collard greens, for those who aren't familiar with them, are a dark green leafy vegetable related to cabbage, but tasting a little more spinach-like. (Collards are similar to kale - which is coming up in that ribollita post !). The leaves are pretty sturdy and stand up to a good amount of cooking; they are popular in the South as well as in Africa and South America. Collards, along with black eyed peas and cornbread are considered "good luck" foods eaten at New Years because all three resemble various sorts of money - start the New Year rolling in the stuff and it will come to you all year ! (that's the thought, anyway...). These delicious greens used to always be the domain of the other foodie-in-residence here. I can't remember where we first had them - I know the local BBQ joint (Blue Ribbon) does a stellar job with them, and at some point we decided they had to be part of our own BBQ feasts. One day whilst such a feast was in the works my co-conspirator was suddenly called away - leaving me to prepare the collards. Having never made them on my own, I decided to check a few sources first...and I ended up with the infamous Paula Deen. (This was before she got herself in trouble, of course). I figured Paula would definitely know a little somethin' about greens; the challenge would be to use things found in my own kitchen and suited to my own style of cooking. Her recipe called for something called "House Seasoning", which I reasoned was some sort of seasoned salt - not something I would have on hand. I did have plenty of Knorr's Chicken Bouillon cubes, though (the only ones I will use; as long as you adjust for the salt they make a perfectly fine stock) - and I also had a little jar of Montreal Steak Seasoning, the hot variety (my sister having purchased it in error and bequeathed to me; I'd never even opened it. ) I looked at the side of the jar, and sure enough this stuff was basically...seasoned salt. (It's very easy to make your own Montreal Steak Seasoning, there are recipes all over the intranet...I found a nice one here ) Okay, I could definitely work with this...and the rest of the recipe I really, really liked. Paula's method of making the flavorful cooking liquid first, then taking the tough part of the stem off and chopping the leaves ("chiffonade", in fancy cookery terms) before adding them meant I wouldn't need to cook the greens to death and they'd taste like greens, not mush. And adding the little bit of butter would get the flavor to stick to the leaves....yeah, I was all over this. 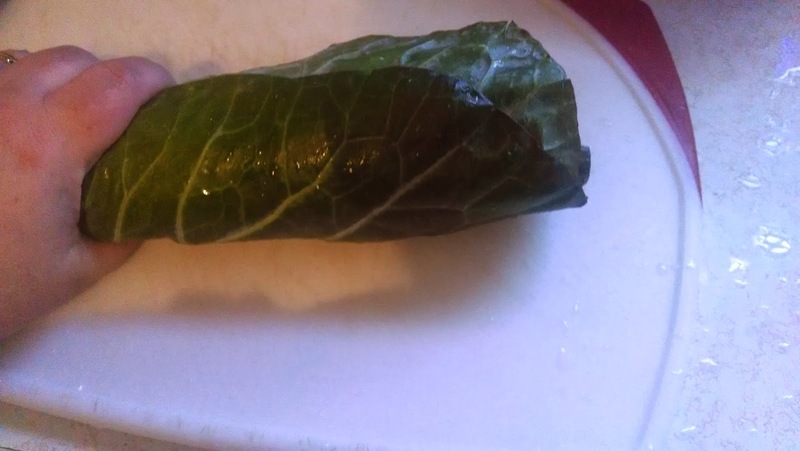 So I dove in and crossed my fingers....and after the first bite, it was decreed that henceforth I would be in charge of cooking all collard greens - a position I happily accepted, because these really were the best collard greens EVER. One other item to discuss before I get to the goods - smoked meat. The traditional meat to use with collard greens would be ham hocks, and indeed that is what Paula Deen calls for in her original recipe. While I love ham hocks, for some reason with these greens I love smoked turkey parts even more - something about the richness of poultry fat just enhances everything else going on here. My preference is to used smoked turkey tails, when I can find them at my local supermarket (turkeys store a surprising amount of fat in their tails) - and yes, they really do have them occasionally at Stop + Shop. 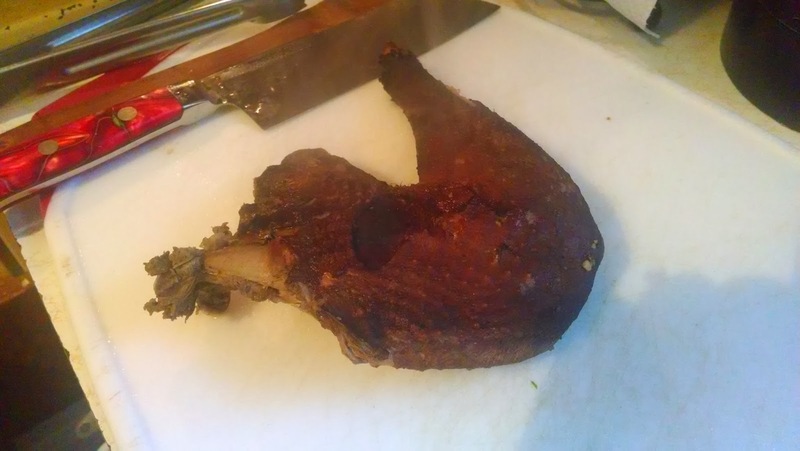 Easier to find are the smoked drumsticks or wings; my photo below is of a wild turkey drumstick that we smoked ourselves, because we really are that awesome. Lacking smoked turkey of any kind, you can definitely (and quite successfully) use ham hocks. Recipe below photos - enjoy ! home-smoked wild turkey...oh yeah baby ! In a large pot, bring 2 quarts of water to a boil and add smoked meat and seasonings. Reduce heat to medium and cook for 1 hour. (If not using the Knorr's, use 1 quart chicken stock and 1 quart water). Wash the collard greens thoroughly. 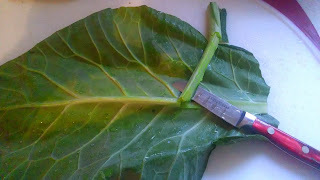 Remove the large stems that run down the center of the large leaves (a small knife helps quite a bit - see photo below. No need to stem the smaller leaves). 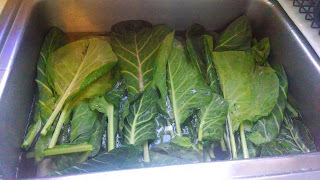 Stack 6 to 8 leaves on top of one another, roll up, and slice into 1/2 to 1-ince thick slices. Place greens in pot with meat and add butter. Cook for 45 to 60 minutes, stirring occasionally. Serve with hot sauce, as a side dish to any sort of BBQ . Usually a little of the liquid is included with the greens while serving; some Southerners actually serve the cooking liquid (called "pot liquor") separately as a soup course...not really my thing, though it is perfectly tasty. We're back ! And what better dish to kick off the New Year than a traditional feed of Black-Eyed Peas and Ham ? Even if you don't believe there's anything to the whole "lucky foods" tradition, black-eyed peas make some mighty fine eating. And hey...what if there's actually something to the good luck thing ? We could all do with a little more good luck this year. "I've got a feeling...that tonight's gonna be a GOOD night !" Black-eyed "pea" is actually a little misleading - these guys are legumes, as are peas - but where peas are usually eaten young and green, black-eyed peas are beans - more like a pinto or Great Northern bean than a green pea. The tradition of eating them as good luck food dates back 2500 years ago to Jewish culture - Jews would eat them during Rosh Hashanah (the Jewish New Year) to symbolize the prosperity that they hoped they would be blessed with for the New Year (click here to read more). Most people, though, associate black-eyed peas with soul food from the South, as they are a food that easily made the trip from Africa with the slaves. It is in the South that the unassuming little pea/bean is truly elevated to glorious heights - for they, like all beans, have a mysterious affinity for the pig - particularly smoked, fatty, delicious pork products. Their "luck" factor is variously attributed to their supposed resemblance to coins as well as the abundance of them in a spoonful. For me, though, the lucky part involves me eating them. My own introduction to black-eyed peas came from my mother's ex-partner - "TT", to my son. T was from Baltimore, and though she didn't give herself enough credit she was an amazing cook - I still have dreams about her fried chicken and homemade lemonade (my requested birthday dinner every year), which I would never even try to duplicate. The black-eyed peas, though...oh, did we love those too. Luckily, the peas were much easier than the chicken. T consented to let us hover in the kitchen long enough to get the hang of this one, and we've been lucky enough to make it on New Year's ever since - with our own modifications, of course, but still true to the original spirit of the dish. Thank you, TT. just look at that HAM ! Cornbread (mine is here ) makes an excellent accompaniment, as do greens (more on those in another post). A note on the vinegar - traditionally, the vinegar is stirred in at the end to kick up the flavor as well as to make the beans a little less...um..."musical". It's totally optional, though - we actually just put the vinegar on the table and let people use it at will. Personally, I like them both ways - so I usually do one bowl with, and one without. Hey, it's your party...go forth and pea !
" As we start the New Year, let's get down on our knees to thank God we're on our feet! " Melt bacon fat in bottom of kettle or Dutch oven. Add onions and garlic and cook until softened and translucent, about 10 minutes. Add peas, ham hock and spices, and stir well to combine. Pour in chicken stock until it just about reaches top of beans. Bring to a boil, then reduce to a simmer and let simmer for an hour, stirring occasionally. When you stir, check your liquid level - add more stock if needed to keep level right below tops of peas. After about an hour, stir in the diced chorizo and ham. Check the liquid level, adding more stock if needed. Simmer another hour, stirring occasionally, until the peas are done to your liking. Remove from heat and stir in additional salt to taste and vinegar, if using. Place beans in a large pot and add enough HOT water from the tap to cover by a few inches. Bring to a boil and boil for two minutes; turn off heat and leave covered for an hour. Drain, and proceed with recipe. Note #2 - "House" seasoning - so there I was researching collard green recipes one day (more on that in another post). 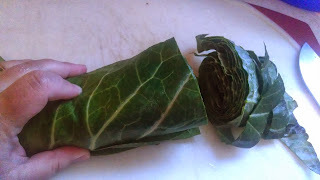 Found a Paula Deen recipe, which seemed to make sense - after all, who would know more about collard greens ? It called for her "house" seasoning, though - which I assumed was some sort of seasoned salt thing. Well, I didn't have any of that - but I did have a jar of Spicy Montreal Steak Seasoning (given to me by my sister, who bought it by accident). Salt, pepper and spices...I figured a little of that would do the trick...wow, did it ever - those greens were AWESOME. Since the flavorings for black-eyed peas are very similar, I used a little of it here too...perfection. When I finally use the jar up, I'll just mix up my own as it's pretty easy...here's a typical blend http://www.canadianliving.com/food/great_canadian_steak_spice.php . Note #3 * - Spanish-style chorizo is different than Mexican chorizo...one of the main differences is that it's fully cooked, which is why it's added so late in the cooking process here. Do not substitute Mexican chorizo unless you plan to cook it first.